President Susan Herbst and Gov. Dannel Malloy, pose with members of the UConn class of 2022 Wednesday. The number of in-state students who will begin their studies at the University of Connecticut this fall increased by 4 percent this year, with about 74 percent of the class made up of Connecticut natives. 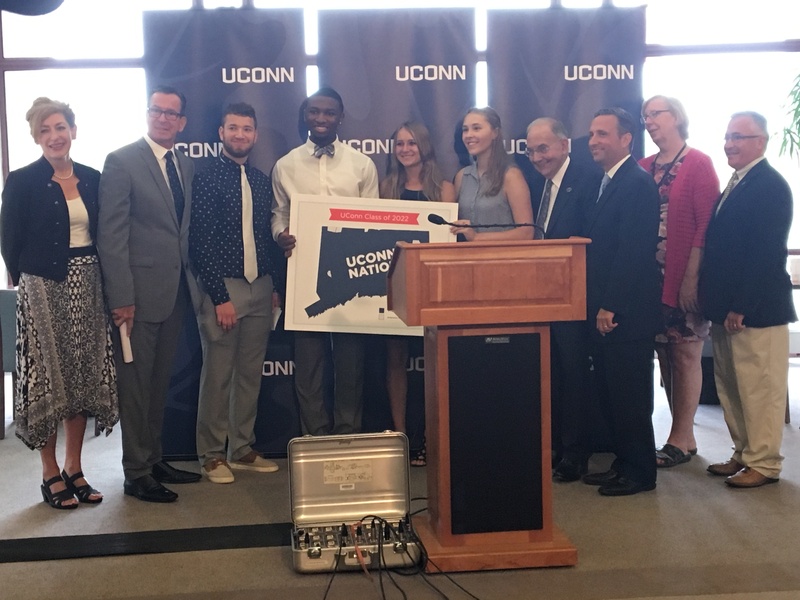 “One out of every three Connecticut high school students applied to UConn this year and over 4000 enrolled, representing 164 of the 169 towns and cities in the state,” said UConn President Susan Herbst during a joint press conference with Gov. Dannel P. Malloy at the Capitol on Wednesday. 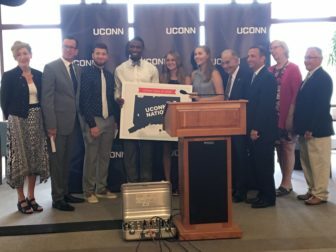 More Connecticut students are able to stay in state for college and attend a top ranking university at a reasonable price due to the investments that have been made in UConn over the past decade, Herbst said. In addition to a higher percentage of in-state students, there are simply more students across the board at UConn’s main campus this year, with 5,500 freshman students enrolled. And it isn’t only the Storrs campus that is growing. The Stamford, Waterbury and Hartford campus all will see record size freshman classes when the semester begins next week. “There have been dramatic increases in regional campuses’ populations throughout my time as governor,” Gov. Malloy said, adding that the number of student enrolled as engineering majors at the Storrs campus has grown by 70 percent larger since he first took office. Throughout Malloy’s two terms as governor, his administration has invested significantly in the Science, Technology, Engineering and Mathematics fields (STEM) at UConn, including the Next Generation Connecticut initiative. These investments have been made with the goal of strengthening the state’s economy with a well-trained, competent workforce that will remain in Connecticut. Despite the fact that the state population has remained relatively stable since the early 2000s, according to the United States census, applications to UConn have increased by 236 percent over the past 20 years, according to Herbst. Although many older Connecticut residents remember UConn as a so-called ‘safety school,’ that is simply not the case anymore, said Rep. Vincent Candelora, R-North Branford. Instead, he said, getting into UConn is now seen as an impressive achievement by parents and students alike. “UConn chose me by presenting the right opportunities financially and academically,” said Samuel Degnan-Morgenstern, salutatorian of Lyman Hall in Wallingford, who will begin at Storrs as an honors mathematics major. Due to UConn’s efforts to provide early-college-experience classes to high school students across the state, Degnan-Morgenstern will be able to start as a second-semester sophomore, allowing him to save time and money and graduate debt free. Officials said that 175 of Connecticut’s 2018 high school valedictorians and salutatorians, including Degnan-Morgenstern, are part of UConn’s class of 2022. UConn now ranks 18th among Public Universities nationwide according to U.S. News and World Report and the top in New England.